Monkeys at the tops of waterfalls and camels chillin’ among palm trees in the middle of the desert, just a few sights on your day trip tours from Marrakech. Grab a guided tour and head into the tallest mountain range in North Africa, or rent a quad and bounce around the dunes. 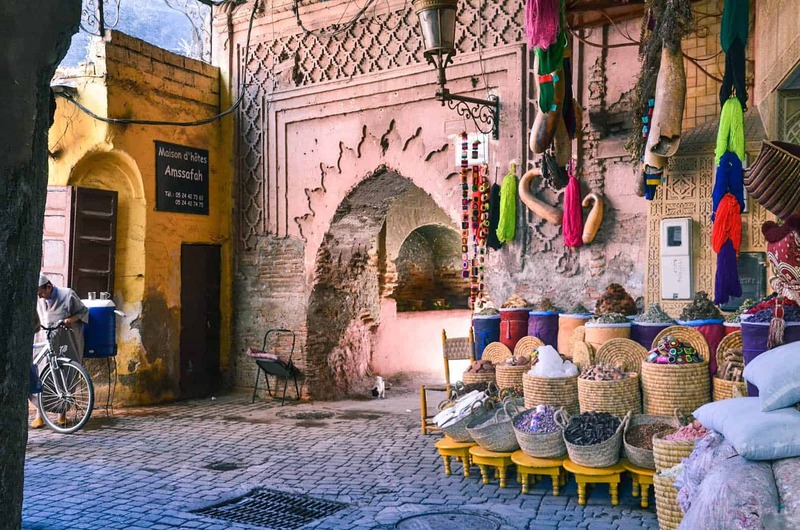 There is so much to do, you might even find yourself taking every single one of these day tours from Marrakech. I certainly wouldn’t blame you. Let’s first start with how you’re going to do these day trips from Marrakech. 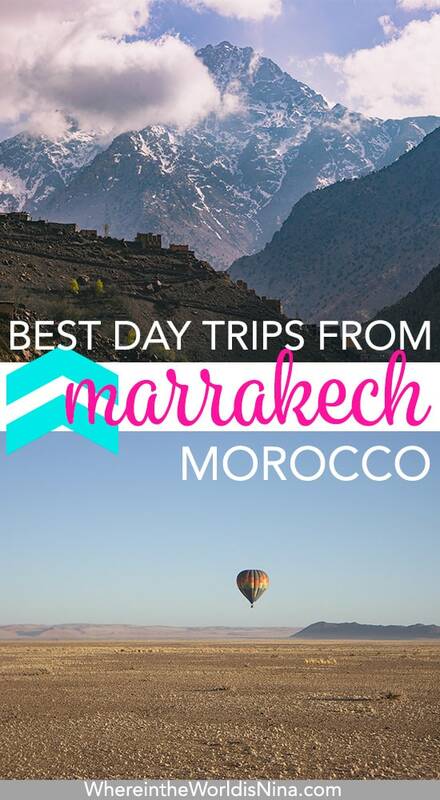 I’ve linked to some of the best tours from Marrakech that you can take to all of these places. While I haven’t had the pleasure of doing all of these, I did the hard part for you and researched the most recommended. Can you do these trips yourself without a tour? 100%. Yes, you can! BUT just know, if you decided to do these day trips yourself, some of them will take far more than a day. Not renting a car? It will take longer. So while everything is accessible by public transport or driving yourself, if you don’t have the time or the desire to deal with driving in Morocco, grab some of the recommended trips from Marrakech you see here instead and put that responsibility in someone else’s hands! And after spending a few days in Marrakech, you just may want to give up on the ‘planning anything else’ part. Here are the best day trips and tours from Marrakech in order from closest to furthest. Because Atlas is just too magnificent to see from only one perspective, hop in a hot air balloon and catch a bird’s eye view of these shockingly gorgeous peaks right as the sun peeks over them. This tour from Marrakech is more like an early morning tour. It takes around 5 or so hours in total but you do it so early (to catch that sunrise) you still have all day! You’ll get some snacks, tea, and pastries before you launch. Then, when you’ve landed, you can sit down in a tent that gazes out at the mountains while you enjoy a full typical Berber spread for breakfast. Bonus: you get a camel ride through the desert with this tour! While this tour from Marrakech sounds super epic, it’s also, unfortunately, the priciest thing on this list! But hey, #treatyoself! Click here to take this unforgettable tour in a hot air balloon. Less than an hour outside Marrakech. Take a day trip staycation. The Palmeraie, just outside of Marrakech, is a sight to gawk at. The ultimate “mirage,” the Palmeraie is an actual desert oasis, though it looks like a dream. Made up of several hundred thousand trees, with camels wandering through them, Palmeraie is the striking experience of a lifetime. Take a guided tour through the Palmeraie, and while you’re out there, you can hop on a quad and ride through the dunes. When you’re finished with your adventures, get a massage at the local day spa before heading back to your hotel. All of your senses will be fully alive on this day trip. Quad bikes, camels, and a spa. Click here to grab this exciting tour. An hour outside of Marrakech. Those mountains! Agafay is the desert in the foothills of the Atlas mountains, and this day trip is the quintessential experience you likely expect to get when you think of going to Morocco. 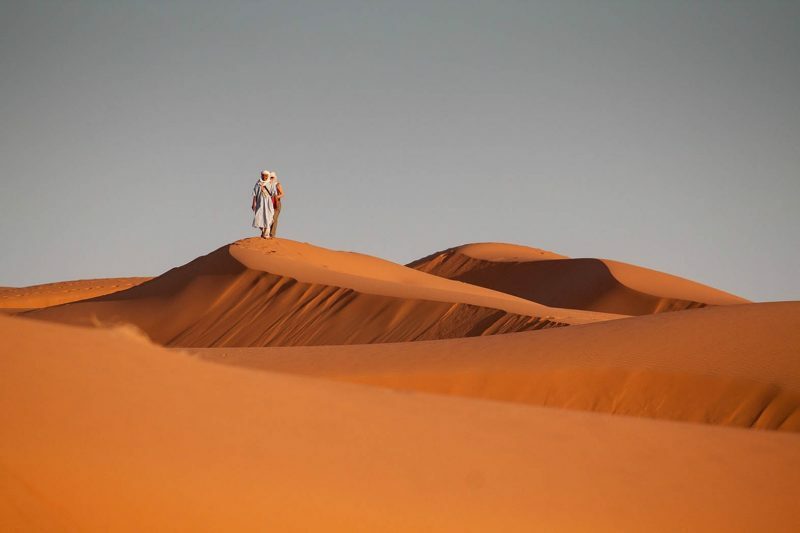 If Marrakesh is a desert city, Agafay is a desert desert. It’s quite undeveloped, so in just an hour’s trip from crazy, winding, maze-like streets filled to the brim with tourists and locals alike, you can look out across a windswept desert untouched by humans for millennia. If you go during spring, you’ll even get to see wildflowers blooming. Agafay also has a man-made lake for swimming and other water sports. There are little villages that surround it as well, so you can grab lunch and even enjoy some light shopping at the local markets. If you can’t afford the time to go to Merzouga or Mhamid for a desert experience, this is the next best thing. Want to cruise the desert in a quad bike? There’s that option as well! Click here to grab this small-group desert tour or here if you want the quad bike adventure in Agafay. So about those mountains… The Atlas mountains stretch from outside of Agadir in Morocco all the way into Tunisia, for a total of 1,200 miles. So there are a variety of day trips from Marrakech to see them up close and personal. 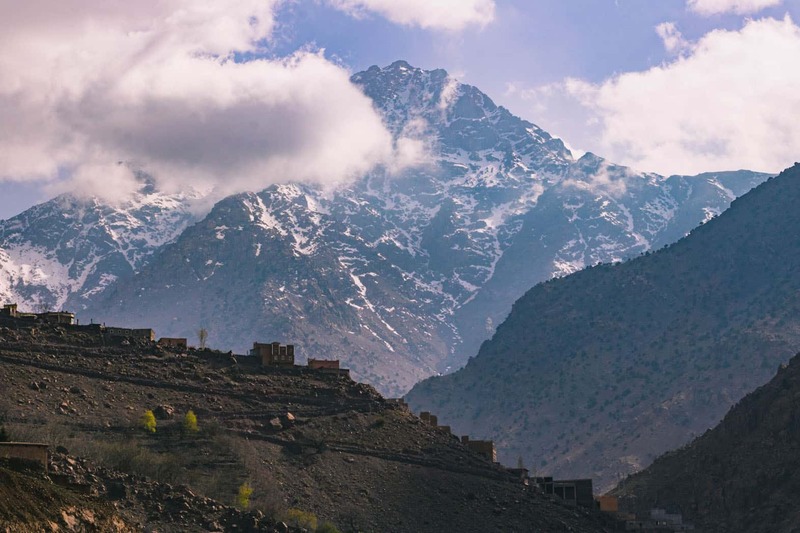 Imlil is a small, quaint, newly created village at the base of the behemoth mountain Jebel Toubkal. 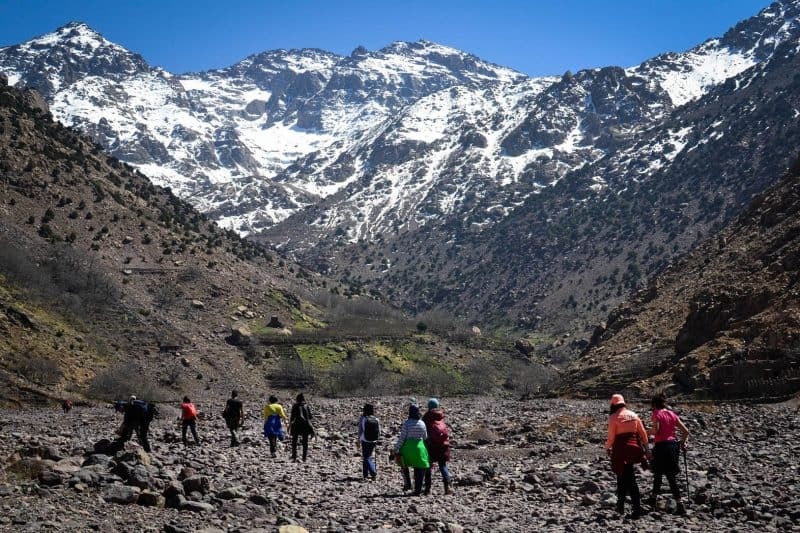 Trekking Toubkal around the valleys is doable on a Marrakech day tour but not for summiting the mountain! The nice thing is, you don’t have to climb the mountain to enjoy the village. There are plenty of shops and opportunities for wandering, even just gazing up at the 13,000-foot mountain is worth the trip alone. And hey, if you decide to stay for a day or two, you can always take a shot at the monster mountain yourself. Click here for a day tour around Imlil including a camel ride and visits to a Berbere village. Want to take on the full hike? You’ll need a guide; this one and this one are the most recommend. Both include everything you need for the hike! Going to Imlil on your own? It will take more than a day but here’s a guide to Imlil and what hikes to do! 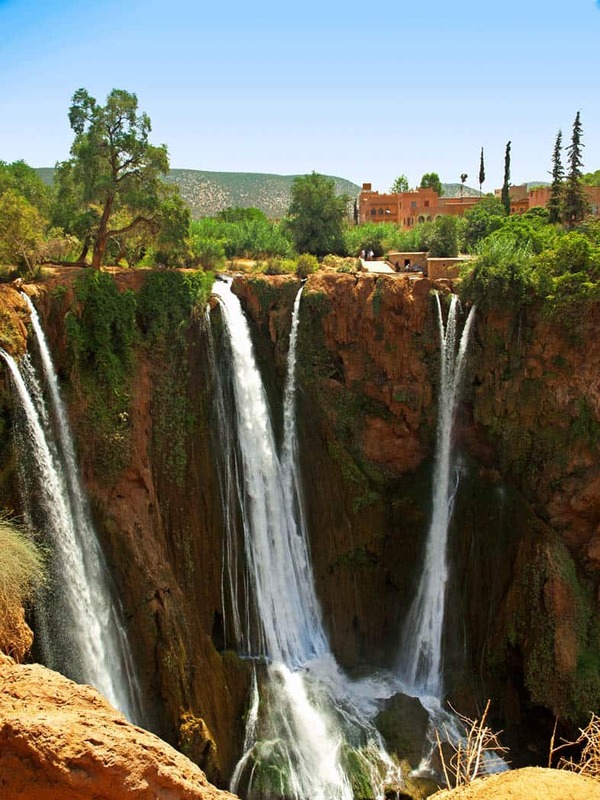 As a kind of combo package, you could opt for this day trip which builds in some sights already included in other day trips, like Ourika Valley and Mount Toubkal. In addition, you’ll get to be amazed by places like the Asni and Oukaimeden Valleys. During the winter, Oukaimeden is actually a skiing hotspot (I know, still surprised Morocco has snow, right?! ), so this is a good chance to scope out the scene if you’re someone who likes to hit the slopes. Click here to check out all the valleys and mountains around Marrakech. Who doesn’t love a good waterfall? You’ll be in the minivan or tour bus for a bit longer to get to these much larger and much more challenging falls. But the beauty is breathtaking once you get there, so this day tour from Marrakech is a must. 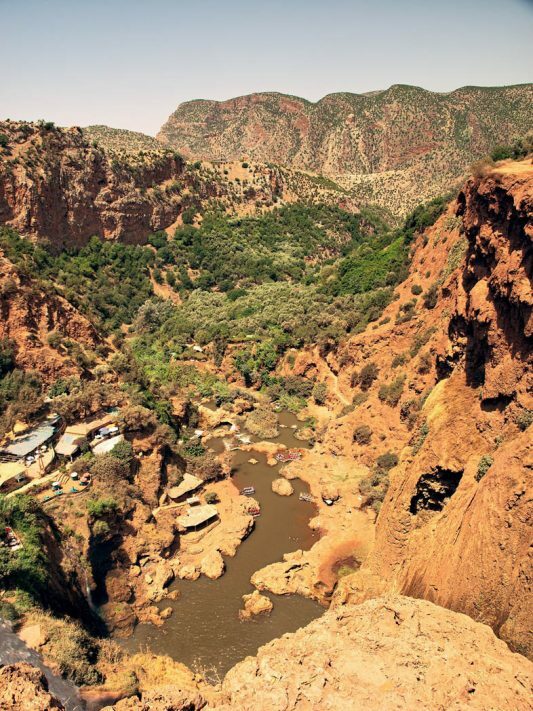 The drive is between two and three hours into the Atlas mountains, and this hike is definitely not for the faint of heart, especially if you plan to walk across the pebble bridge to get to the foot of the falls. Wild monkeys will come out to greet you, there is a boat ride to the base of the falls if you’re not into slipping on pebbles halfway around the world, and you can find some great food up this ancient mountain range. Grab this highly recommended tour to Ouzoud Falls by clicking here. TIP: Double check what the weather will be like. If you go after some heavy rains the falls can be brown. Talk about a Marrakech day trip. In less than a few hours, a guided tour can get you hiking up seven different waterfalls all in one day! You’ve gone from dry heat to green, lush valley almost in the blink of an eye. On the way you can visit locals who produce argan oil, watching the process and even taste some of the fabulous oil with bread. You’ll cross rope and board bridges, scope out camels, feel the splash of falling water on your face, and you’ll swear you just stepped into a movie scene. Indiana Jones ain’t got nothing on you. Be sure to wear comfy shoes and clothes; this is no walk in the park. It is an actual hike that can get pretty intense. But boy is it worth it. Click here and grab this cheap tour to Ourika Valley. Essaouira is a great contrast to Marrakech; you’re heading from a stunning desert oasis just over two hours away to a beautiful glittering beach. Essaouira is on the North African coast, right on the super windy North Atlantic, so hanging in your bikini or trunks can get a bit chilly unless it’s the height of summer. Swimming can also be risky AF since the current gets strong and will pull you out and under before you know it, so stay shallow if you go out. But you’re likely not going for the swimming. You’re going for the views, for the medina, where you can wander down narrow alleys and shop in open door markets. You’re going for the serenity. Essaouira is a perfect Marrakech day trip to get out of the bustling and chaotic city. And if you have more time, those winds are perfect for kiteboarding and windsurfing! 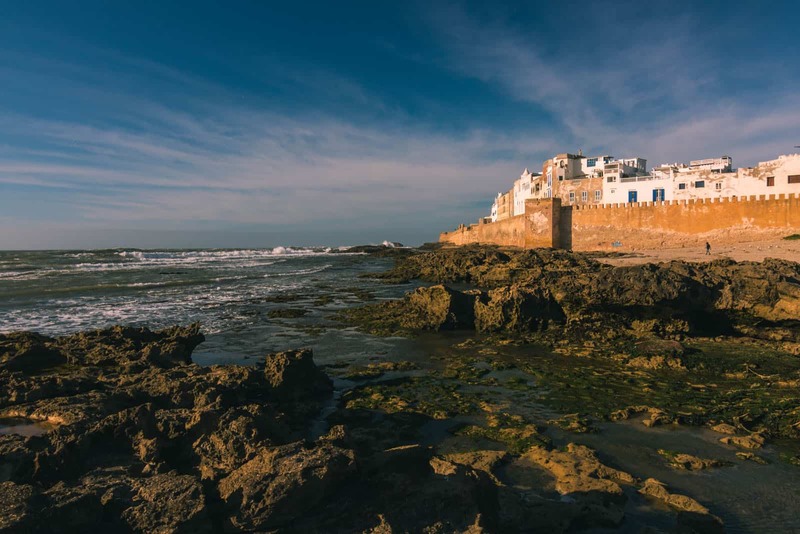 Click here to see Essaouira and visit an Argan oil co-op. Falling in love with the coast of Morocco? I don’t blame you, read this for more of Morocco’s best beach towns! Three and half hours outside of Marrakech. Looking for a real-life history lesson? Head to Ait Ben Haddou. Of all the Marrakech trips, this one is where you’ll get to experience what life was like for people of the area hundreds of years ago. A UNESCO world heritage site, these structures stand as a testament to ancient southern Moroccan architecture. You’ll see defensive walls and towers, homes build into the foothills of the Atlas mountains, fortifications, and you’ll stand in the location of a trading post from the 17th century. If only history was this cool in high school. Ait Benhaddou from a viewpoint. While Ait Ben is beautiful (although, I will admit, certainly not a secret and gets very busy) I think the drive might be the best part! Taking the Tizi-N-Tichka mountain road will be just as beautiful as the sites themselves. Side note: if you’re a huge Game of Thrones fan–THIS tour is the one to take! If you’re a movie buff, this tour is for you as well. Ouarzazate and the surrounding have been well known as Morocco’s little Hollywood and have appeared in hundreds of movies. Click here to grab this tour to Ait Ben and if you’d prefer a private tour, this one is highly recommended. 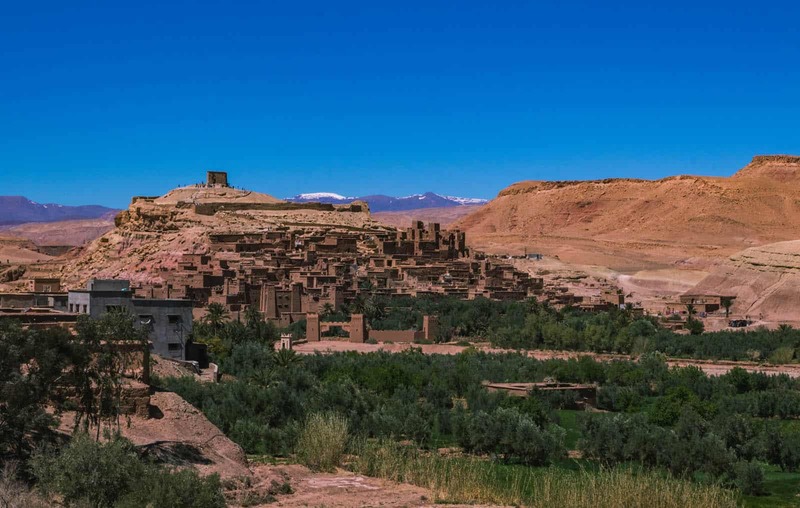 Checking out Ouarzazate and the surrounds for more than a day tour from Marrakech? There’s a lot more than just Ait Ben Haddou. 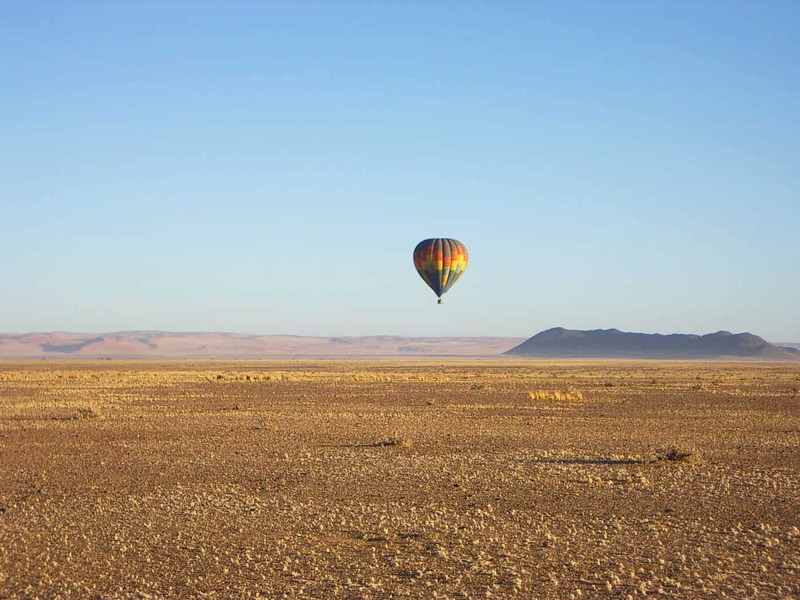 Here’s everything you need to know about visiting Ouarzazate. Besides being more convenient, I’d highly recommend taking the time to book your day tours in advanced. 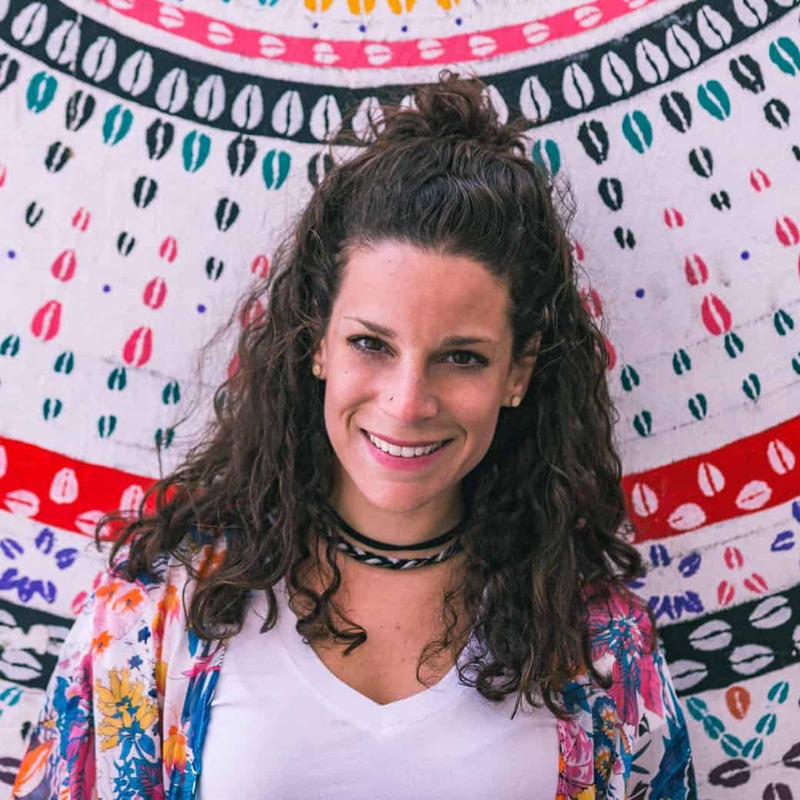 Moroccans are lovely but Marrakech can sometimes be a bit hectic for some people and sometimes the tour operators in person may be a bit pushy. If you want to avoid this, book online, get picked up from your hotel, and never have to step foot in a tour agency once you get there. I hope this was helpful for anyone wondering what trips from Marrakech they can do! Of course, there’s plenty of picturesque places in Marrakech, but something you just need a getaway, right? This list should keep you pretty busy. Wandering around Morocco some more? I have HEAPS of information in the posts below! 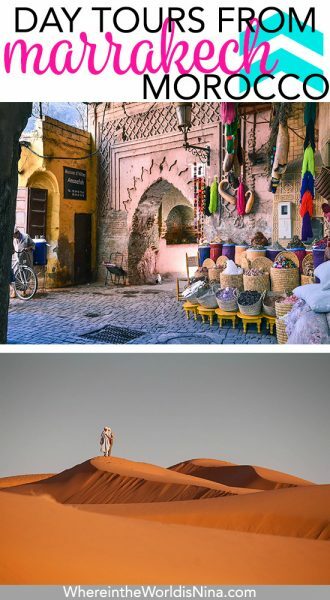 Which of these tours from Marrakech are you planning on taking? Let me know in the comments! 25 Tips for Driving in Morocco & Why a Morocco Road Trip Is a MUST! Best Time to Visit Morocco: When Spring Is in the Air! Finding Goats in Trees in Morocco: Yes, This is Real Life! Don’t lose this post! Click the picture to pin it for later. These places are awesome, I have been gone many times. Thanks for sharing with us. !